Belle really is a girl who brings together the best of both worlds. Not only is she a beautiful young woman, but she also enjoys broadening her horizons and strengthening her mind! That's why she spends so much time studying books and learning, and we think that's awesome. She's proof that a bookworm can have the courage to stand up to a bully like Gaston. She's proof that a warm heart can melt even a cold heart like Beast's. She's proof that a Disney princess can look great in simple peasant's dresses, OR elegant gowns! Now, your girl can be just like the classic princess! Based on the iconic princess from Disney's Beauty and the Beast, this licensed tween Belle costume brings your girl a simple, yet cute, style based on the classic character from the animated film. 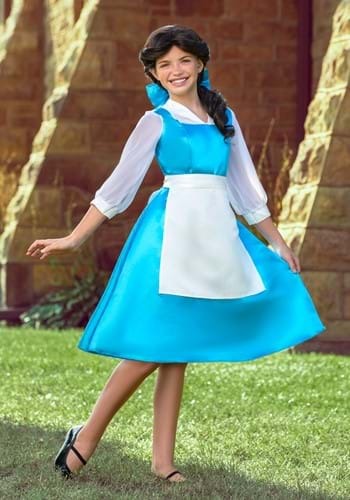 It's a blue satin dress that looks just like the one that Belle wears in the movie, along with a white apron. Once your little girl has it on, she might just find herself spending more time in the library and she may even befriend a talking candle or two! Just make sure you teach her the importance of compassion and an open mind before you send her off to The Beast's castle while wearing this classic look.